The weight loss industry is worth billions of dollars because everyone wants a short cut to losing weight and getting six pack abs. Everything from workout programs, gadgets and weight loss pills. Incredible. Frankly, if you are ever going to lose weight fast, you’ll need to get people out of their “comfort zone”. More on that in a minute. Thus the 4 minute workout was born. It’s easier to sell 4 minutes rather then 30 or 60 for that matter, especially to lazy people. We’re not talking about Roger Bannister and the Four Minute Mile here. "[6 to 8 very hard 20 second intervals with 10 second rest periods] may be one of the best possible training protocols…." Do the math… that adds up to a three to four minute workout. The Concept Rowing II machine is a wonderful device for this workout. Trust me on this. 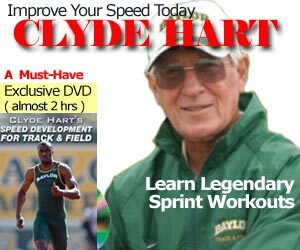 For track athletes, try a “split 500m”: sprint at 95% for 300 meters, 90 seconds rest, then sprint 200m with whatever energy you have left. That should take you under 3 minutes. Do two sets and report back your times, if you don’t throw up. If that workout too daunting, try 200 meters, 60 seconds rest, then sprint 200m. Why the 4 minute workout? Personally, my circuit training workouts are 30 minutes long. See my previous blog posts here and here. Circuit training hurts. Why? Because it takes people out of their comfort zone. This isn’t a walk in the park or a jogging while holding a conversation. They are short intensive burst of hard physical movement, followed by a short rest. If you want more detailed interval training plans, then I prefer fellow Canadian Craig Ballantyne TT workouts in this article (mainly because he’s Canadian.. but we do have our indifferences on which city has the best Hockey team, Montreal or Toronto). But if you still are not satisfied with 20 to 30 minute workouts, then I’ll give you two examples. The NO Excuse Workout includes 2 DVDs each packed with 10 short, intense workouts. Every workout is exactly 4 minutes long, broken down into 8 specific sets. Sounds like the Tabata protocol, doesn’t it? In fact, this is not really 4 minutes but 12 minutes, because eventually you do 3 sets. Luckily, I can do the math. PACE stands for Progressively Accelerating Cardiopulmonary Exertion with interval training being the primary workout. He suggests you use your own bodyweight and not weights to exercise for strength. He claims weight lifting is dangerous and unhealthy and gives numerous examples to back him up. Before the modern fads of aerobics, cardio and weight lifting took over and created the commercialized modern gyms, going to the gym used to mean boxing, wrestling, pushups, chin-ups and calisthenics. For history sake, Jack LaLanne was the inventor of the modern gym which started in the 1930’s in Oakland. All his exercises were based on movement and bodyweight exercises with the occasional med ball.